I understand this is for Mac Computers. 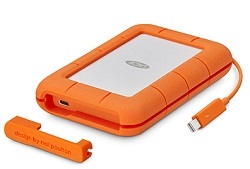 For over a decade, LaCie Rugged drives have thrived where only the toughest survive—the film sets, photo shoots, and music studios of the world’s most influential creative pros. Why? Because LaCie Rugged products are the industry’s most trusted way to capture and transport data in the field. Bitdefender Antivirus for Mac provides absolute protection against new and unknown threats without slowing down your Mac. It connects to Bitdefender’s advanced Cloud-based technologies to instantly detect and block threats, regardless of where in the world they are born. If you use Time Machine to back up your files, you’ll want Time Machine Protection to make sure you are safe from sophisticated ransomware attacks.